AER LINGUS HAD to cancel three flights from Gatwick Airport in London to Dublin Airport yesterday due to “severe weather conditions”. A spokesperson for the airline told TheJournal.ie the flights were cancelled as “the lengthy waiting times for de-icing caused crew to reach their maximum hours”. The spokesperson said the airline’s handling agent sought hotel accommodation for customers but was unable to secure accommodation for everyone who was affected by the cancellations. “Some guests managed to secure their own accommodation and others unfortunately had to spend the night at the airport. “Additional flights were scheduled today to bring guests back to Dublin. Guests who secured hotel accommodation themselves will be refunded the costs incurred. “We apologise sincerely for the inconvenience caused to our guests,” the spokesperson said. 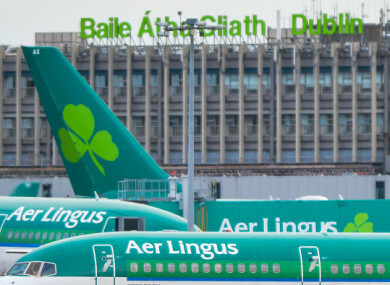 Email “Aer Lingus apologises after people spend night in airport due to flight cancellations ”. Feedback on “Aer Lingus apologises after people spend night in airport due to flight cancellations ”.